Amsterdam Brewing is fast becoming a favourite of mine. 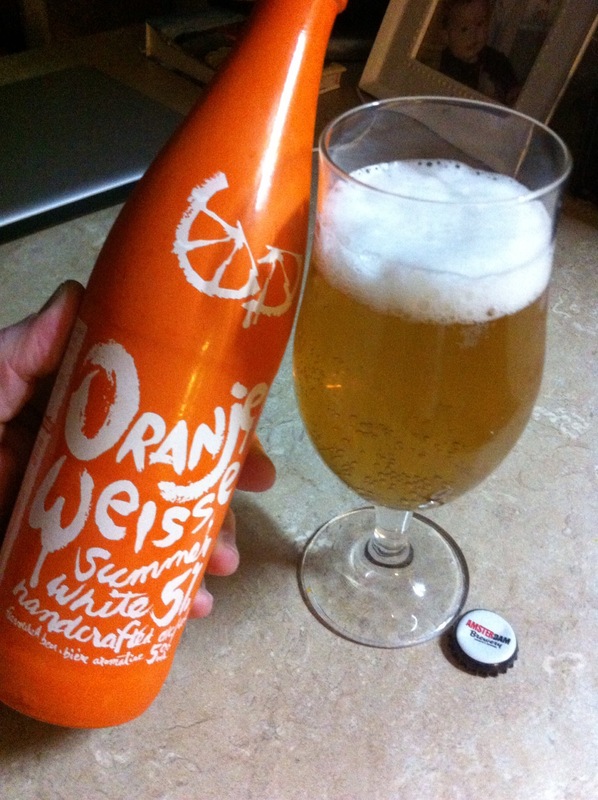 I’ve had a few of their brews and none have disappointed, and this Oranje Weisse is no exception. This Canadian take on a traditional Belgian style is certainly meant for a hot summers day, but no one would fault you for drinking it any time of year. From the brewery: A refreshing flemish style white beer brewed with two types of orange peel, coriander, and a touch of ainse. A truly unique flavour combination of citrus and light spice. All natural ingredients, unpasteurized. Appearance: It pours beautiful. Great big, fluffy white head. Its golden in colour and slight haze – trademarks of a witbier. Aroma: The aroma is bready/yeasty. There is a dominance of wheat, with a slight slight funk and a bit of malt. Taste: The flavour is mainly of the wheat, but there is a good amount of orange peal coming through, with a slight spice and some coriander, bread, and lemon flavours. Very much in the traditional witbier style. Mouthfeel: The body is light and the carbonation is moderate. Not as spritzy as some witbiers, but still light on the palate. Overall: This is really a nice beer. Probably best on a hot day, but I think I could enjoy it all year. It’s light, refreshing and quite tasty. Quite pleasant. 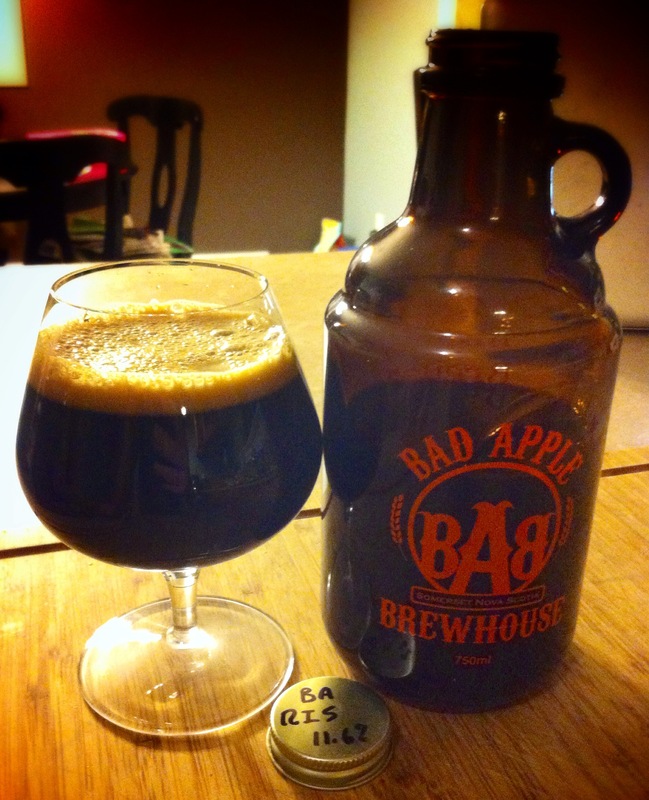 Bad Apple Brewhouse is a new brewery on the Nova Scotian craft beer scene that’s making a big splash. Located in Somerset, N.S., it’s recently taken home some hardware from the Atlantic Canadian Beer Awards, including Brewery of the Year. It’s Black and Tackle Russian Imperial Stout is also a winner, taking a Silver and a Bronze. Appearance: Inky black, the only way I could see light through it at all is looking through it as I poured a thin stream. Slight head that is tan in colour. Some lacing, but the head fades. Aroma: There’s a big hit of alcohol in the nose right up front, like a smack in the face. The whiskey barrel aging comes through with lots of the whiskey in the aroma. There are notes of liquorice and some of the malt does come though. These a slight fruity note as well, maybe a yeast character. Taste: First impression is how smooth this beer is for being so big (11.6% ABV). The alcohol is there, but its not hot at all and displays the whiskey traits. There is some roast, but its rather subdued and the hop bitterness is balancing. Neither sweet nor overly bitter. Some hop flavours come though as a slight fruity/floral back-note to the beer. Malt shines as a bready/biscuit flavour holding together the other flavours. A complex beer. Mouthfeel: Medium body, light carbonation. Overall: Well done, a well made beer showing off the skills of the brewmaster. In high demand for good reason; if you find it, buy it. Sip and enjoy. Smooth: pace yourself. You can find Bad Apple on the web, Facebook, and Twitter. There is a great number of micro breweries throughout Quebec that are producing outstanding Belgian styled beers for many years. 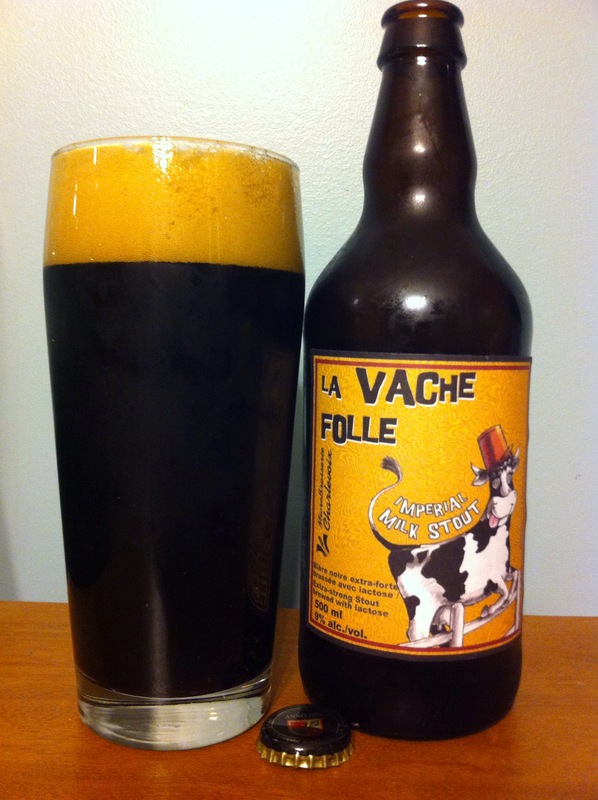 But there are now an ever growing number of breweries producing excellent English styled beers, and MicroBrasserie Charlevoix – La Vache Folle (translates to The Mad Cow) is following that path. Their take on a milk stout (also known as a sweet stout, its a less roast-more body version of a stout that utilizes lactose (milk sugar) for body and sweetness) crosses the threshold from ordinary to big and bold. Appearance: Black, nearly completely opaque. Pours with a nice, dense, creamy, tan head. Great lacing on the glass – right front top to bottom. Aroma: The aroma is of sweet malt with a bit of chocolate and dark fruit. There’s hints of spice and roast and just a faint note of floral hops, barely enough to say it is there. Taste: The first thing that hits is the alcohol, its right up front – not burning, but smooth – you know this is a high-test beer. Next comes the sweet malt flavours, not to say this is a sweet beer, but it is not like a dry stout or a hoppy imperial stout either. The flavour is of bread and stone fruit, with slight hint of roast. There is a bit of milk chocolate mixed with hits of dark chocolate. Mouthfeel: The body is creamy, medium body – maybe a little thiner than I expected, but that lets this big beer be quite drinkable and not heavy. The carbonation is fairly light letting the beer keep the creamy texture. Overall: Not too bad. It gets a bit better as it warmed up a little and allowed the alcohol notes fade slightly. Be warned, this can be a little dangerous because it is rather easy to drink, but at 9% ABV you might just find things becoming a little wobbly. MicroBrasserie Charlevoix can be found on the web, Facebook, and Twitter.